While Saturday's qualifying session in China did not build to a crescendo, an hour's worth of Formula 1 action set up Sunday's race with an unusual grid. At first glance, it may not seem to be any different - with Sebastian Vettel take top honours. However, he'll be chased down by two McLarens with no support from his teammate. Mark webber didn't manage to make it out of the first qualifying session. Meanwhile, Renault had quite a time of it, with Vitaly Petrov's car dying beneath him and causing a red flag, which in turn ruined Nick Heidfeld's one and only lap in Q2. You run a risky strategy, you have to take the consequences. Here's how qualifying unfolded, minute by minute. Good morning, how are we all? This is the Factbyte Factbox for qualifying for the Chinese GP. So far, Sebastian Vettel has led every session this weekend. Can anyone take glory from him today? The BBC coverage has just begun, and we have about an hour to go before qualifying starts in earnest. If you're watching today, why not join in the comments on Sidepodcast? https://sidepodcast.com/dashboard It has comments, Twitter and your humble FBFB all in one place. There's a poll over there, asking whether you think Adrian Sutil will ever manage to outqualify his speedy teammate Paul di Resta. Go vote and have your say. Talking of which, here are the fastest times from the sessions so far. For reference, pole position last year was, you guessed it, Sebastian Vettel, with a 1:34.558. Williams continued to lack pace in FP3, with a 17th and 18th place finish. The team are evaluating a new exhaust system, trying to decide whether to use it in the race. That is Q2, of course, unless they have perfected the art of time travel. Nick Heidfeld finished FP3 in 11th position for Renault, and thankfully needed no new front wing. He crashed twice, one in each session, on Friday, required two nose changes. He had to run with an old wing this morning because he has no new ones left! Vitaly Petrov is running a new chassis as his old one had to be sent back to the factory after his airborne antics from Malaysia. Tweet from @InsideFerrari: It will be a tough Q session. Apart from Red Bull and McLaren, who are out of reach, Mercedes looks very strong. About half an hour to qualifying now. Mark Webber struggled with his KERS device in FP3 again - the same trouble that gave him a terrible start in Malaysia. Interview with Christian Horner: "We had a bit of a messy morning with Mark this morning, we had an electrical problem which necessitated quite a bit of work. The guys are working against the clock, we should be fine." Everyone in the paddock seems to be bundled up in coats, so it's not as hot as it has been previously. Horner confirms that it's likely they won't be running KERS on Webber's car in qualifying, but they should have it fixed for the race. Interview with Ross Brawn: "A few issues have become apparent with the car now we're in hot conditions. It's a little bit better this weekend... The rear wing system worsk really well but we've got a fairly chronic overheating problem." 15 minutes to go, and live timing has cleared of FP3 results. Interview with Bruno Senna, reserve for Renault: "It's a great pleasure for me to be part of this team... it's brilliant to be with a team that have been champions before and are doing really well this season. We do a lot of work with the team, try to participate as much as possible with the team meetings, so I'm always current." Tweet from @antdavidson: With less than 20 mins to go to the start of Q1 Webber's car still on high stands in garage. Mechanics working flat out. The BBC track walk is Martin Brundle with both Nico Rosberg and Jock Clear. Good insight into the relationship between driver and engineer. Nico is wearing some shocking yellow shoes. Maybe it is for visibility. We've closed the poll in the live thread, and 62% of you believe that Sutil won't manage to outqualify his rookie teammate this year. Poor Adrian. Heikki strapped into the car, ready for the session to begin. Sergio Pérez and Paul di Resta head out of the pitlane first. We've got 20 minutes to knock out seven drivers - assuming they're all within the 107% of course. Brundle reports this is the worst start to the season for Williams in their entire history. That's quite a lot of history. Three minutes complete and more cars are heading out on track now. Pérez sets the first time of the session - 1:38.295. Just two Red Bull drivers, Buemi and Kobayashi remain in the garage. Pérez improves to 1:37.585, Paul di Resta behind him, then the pair are split by Heidfeld. Replays show Paul di Resta locking up seriously on his last lap, but he still managed to improve to second. Jenson Button pops up to P1 - 1:36.778. Paul di Resta locks up. Alguersuari surprises all by putting in a 1:36.156 for P1. Just Kobayashi remains in the garage now, and we have 19 lap times on the board. Now Hamilton leads, it won't be long before the times drop below 1:36. Webber's first time sees him in 14th. The mechanics did a great job getting him out there but he'll want better than that. Vettel is only in 5th at the moment, though, with two Toro Rossos ahead. I never thought I'd be able to say that! Halfway through this session, and the drop zone features: Trulli, D'Ambrosio, Glock, Liuzzi, Barrichello, Karthikeyan and Kobayashi. The Sauber has just left the garage for his first lap time, and assuming he can improve, will drop Heidfeld into the bottom seven. Petrov and Heidfeld both down near the drop zone - 16th and 17th currently. Barrichello improves to 13th, meanwhile Vettel has jumped up to P1 - surprise, surprise! Rosberg clearly found some time for his second and third lap, he's currently in sixth place. All cars have completed a lap time, all are well within the current 107% time. Nick Heidfeld improves up to second place, the top three now VET, HEI, BUT. His teammate Petrov is currently sitting in the drop-zone. Di Resta displaces Heidfeld for second position. They are just over a tenth off Vettel's pace. Joining Petrov in the bottom seven includes Kovalainen, Trulli, D'Ambrosio, Glock, Liuzzi and Karthikeyan. One minute remaining - Alonso has jumped up to P1 with Massa behind. Sudden pace from the Ferrari. Petrov drastically improves from the drop zone - jumping up to P1, instantly replaced by Rosberg. Schumacher is now down in the drop zone but if he can emulate his teammate's pace, he should be safe. Webber remains 16th and doesn't have a chance for another lap. He may just squeeze through, but it's close. Schumacher hauls himself out of the drop zone, putting Maldonado there. The Williams improves to 16th and that means Webber is out! Mark Webber ran all his laps on hard tyres, which seems like a strange decision given that he was clearly struggling. Webber climbs out of the car and disappears out the back of the garage. Not looking too impressed, as you can imagine. Alguersuari leads his teammate Buemi out first in this fifteen minute session. Brundle fact: This is the first time Webber's been out in Q1 since Bahrain 2009. Vettel is also out on track, joined by Button and Di Resta. Pictures show Webber confronting Jo Bauer of the FIA, with some gesticulations. We're not sure what that is about, although perhaps that he got caught up in the weighbridge. 15 of the 17 cars are out on track, just two Renault drivers still in the garage. Alguersuari has P1 at the moment - 1:35.888. Button puts in the fastest lap of the weekend so far - 1:34.662. According to Red Bull, Webber was checking with the FIA whether he needed to be weighed himself, not any weighbridge angst. He's not clear on the procedure of being knocked out so early! Meanwhile, Hamilton has improved on Button's time to take P1. Neither Renault driver has left the garage in this session yet. Joining them in the drop zone - Barrichello, Buemi, Schumacher, Kobayashi and Maldonado. Team radio to Rosberg: "We're going to swap to option tyres, one timed lap for the next run. So just get your head around the tyres." Petrov leaves the garage now. Just Petrov and two Toro Rosso drivers out on track at the moment. The rest of the field preparing for their final shot at qualifying. Buemi improves to 5th, Petrov to 4th. Heidfeld is out of the garage. He has 2 and a half minutes to get a time. Petrov has stopped out of track. Petrov climbs from the car, he's qualified at the moment, but wouldn't be able to take part in Q3 if he makes it. Equally, he's screwed up Heidfeld's plan. There's still time, but the pressure is on. Vitaly Petrov causes a red flag. Team radio from Petrov: "Something wrong with the gears." We have 2:02 on the clock, and one car without a time. The drop-zone includes: Pérez, Rosberg, Barrichello, Schumacher, Kobayashi, Maldonado and Heidfeld. This is a long red flag period, the Renault barely seems to have moved at all! The marshals are just standing around looking at the car. Team radio from Rubens: "I hope Petrov gets a penalty because it's not fair he stopped in the middle of the track." Restart at 14:49 local time. Cars are queuing down the pitlane waiting for the session to restart. An unusual sight! Pérez is heading up the queue, which is a good position, but will they be overheating? Ted Kravitz reported that all the mechanics were peering out the garage to see which car started smoking first. They appear to have all gotten away well though. A Ferrari is spotted overtaking (in qualifying! ), they are all squabbling for track position to get clear air for a lap. It was Alonso squeezing his way past Pérez for the position at front of the pack. Actually it was Massa, my bad. That was close, but it looks like they all managed to get across the line for a lap. Heidfeld definitely did. Drivers remaining in the garage - Hamilton, Button, Vettel, Petrov, and both Toro Rossos. Heidfeld crosses the line 16th, so after all the kerfuffle, he doesn't qualify through to Q3. Paul di Resta finishes 10th, outqualifying Sutil again. Sergio finishes ahead for the first time this year. Interview with Mark Webber: "Very frustrating day... We got caught out on the first set, and we just weren't quick enough at the end of the day. We paid the ultimate price today. I thought we had enough to get through, turns out the second set of primes... anyway that's the way it goes." He was so annoyed he left his sentence unfinished. "Turns out the second set of primes..." what? Schumacher shows improved pace but still doesn't make it through to Q3. The gap between lap 11 and 16 is the red flag. Interview with Petrov: "I don't know, I think after the second corner, something started to be wrong with the car. I tried to press the throttle, it was not working. I tried to change the gears, it was not working. We need to check, analyse what happend. I'm very disappointed, because we did a big step on setup, we made a big improvement from yesterday to today." Final ten minutes to determine pole position. Only nine cars will be running, as Vitaly Petrov qualified but his car is broken. Vettel and Button are out on track already. They are both on soft tyres. Button is leading Vettel, but in terms of times, Sebastian has put in two fastest sectors. Half the session gone and just two laps completed. Both Toro Rosso drivers have left the garage - I only just noticed they're both in! Go STR! Current order Vettel, Button, Alguersuari and Buemi. The gap almost two seconds between the top two and the Toro Rossos. Now seven cars out on track with both Toro Rosso drivers returning to the garage. Comment from Lukeh: 1st place is soooooo last season. It's all about who gets pole on 2nd! One minute on the clock. Di Resta up to fourth, pushed down by Alonso in third. Nico Rosberg takes third, all eyes on Hamilton. Lewis Hamilton only manages third, behind teammate Button. Both Vettel and Button abandon their laps, aware they cannot be beaten. Vettel is still sat in the car, a long time after parking up. Finally, he climbs from the car. We get to eavesdrop on a chat between Hamilton and Button. Jenson admits he gave up his lap because he was too far down. "Pushed too hard." Tweet from @autosportlive: It is the 18th pole position for Vettel, after another dominant performance. He is 0.7s clear of both McLaren drivers. Apologies for the crushed McLaren names. Blame Vettel for being too fast. Press Conference Quotes - Sebastian Vettel: "We did it again. I tried to keep reminding myself and the team that every single time is tough. Today wasn't as straightforward as we planned. Especially in Q2, I did a bit of a mistake. In Q3 I was able to improve a lot. We did a good job one more time but all it is is eight metres tomorrow. It will be a long race, we can be as happy as we can with the car. We have reason to feel good but it's also a threat to feel too good. Tomorrow is a new day and whatever happened today is not of much importance except we get a good spot on the grid." Press Conference Quotes - Jenson Button: "You always hope it's possible but the pace in Q3 was phenomenal of Sebastian and Red Bull. When I saw Seb's time I thought we're going to have to settle for second place. It's nice for me, this is my best grid slot of the year. I think we've improved the car a lot, we should be happy with what we've achieved today. Big thanks to the team." Press Conference Quotes - Lewis Hamilton: "The last race showed how important it was to have fresh race in the tyres, I only had two options that I could use... I wanted to make sure that I had plenty of fresh tyres. We're in quite a strong position... just tried to increase the chances for the race because that's where it actually counts." Interview with Paul di Resta: "Couldn't have wished for any more today. That was satisfying after yesterday. We brought a small upgrade here and it certainly improved the performance. Our race pace seems not that bad, so fingers crossed we can pick up some points again. It's not an easy challenge going into qualifying. The nice thing was I did my quickest lap on the second run of Q1. Thankfully the last lap, there was a small mistake, but nothing we can be too disappointed out and we're starting from eighth tomorrow." That's about it for qualifying then. A non-surprising Vettel pole, but pressure from two McLaren's behind him. The fast-starting Renault have their work cut out for them, with a 10th and 16th place on the grid. It'll also be interesting to see what Toro Rosso can do, now they are thoroughly mixed up with the top ten. 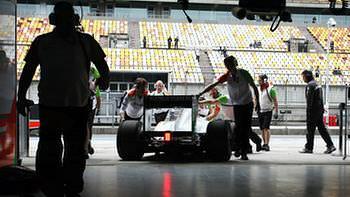 What kind of chaos will the Chinese Grand Prix bring? Many thanks to you all for joining me today, I will be back tomorrow at a similarly early time to cover the Grand Prix itself. I hope you will join me then, and we'll work through it all together. Bye for now!